Heavenly Father, we pray for northeastern Australia as thousands of Townsville residents have been forced from their homes by record-breaking flooding –with more rain still on the way. First, we rejoice that no deaths have been reported, despite the floodwaters forcing some people to take shelter on the roofs of their homes. 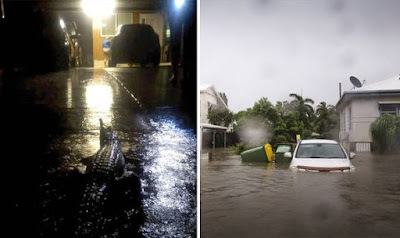 With the additional threat of power outages, as well crocodiles and snakes being washed into residential streets, we ask protection for rescue workers and those trying to flee. We pray for people to proceed with wisdom and caution as they deal with intense flash flooding and treacherous, sometimes deceptive, water flows. We also pray that the Ross River Dam holds strong, despite being stretched well past its capacity. We pray for medical needs to be met, despite traveling obstacles and power outages. Finally, we pray for your peace to descend upon the Townsville area during this time of trial. In Jesus’ name we pray, amen.